This thrilling new adventure game from master storyteller Jane Jensen (Gabriel Knight, Gray Matter) and Phoenix Online Studios (Cognition, The Silver Lining) introduces Malachi Rector, an expert in antiquities whose photographic memory and eye for detail transform people and clues into interactive puzzles. When a secretive government agency enlists him to determine whether a murdered woman in Venice resembles any particular historical figure, Malachi is left with only questions. Why would the U.S. government hire him -- a dealer of high-end antiques -- to look into a foreign murder? Why does David Walker, a former Special Forces operative he meets in his travels, feel like someone Malachi’s known all his life? And how come every time Malachi lets his guard down, someone tries to kill him? Moebius: Empire Rising is a contemporary adventure that merges classic point-and-click puzzle solving with Jane Jensen’s sophisticated storytelling. Travel the world using Malachi’s unique deductive powers to analyze suspects, make historical connections, and uncover the truth behind a theory of space and time the government will defend at any cost. Blends 2D and 3D graphics to provide sophisticated storytelling, atmosphere and puzzles. Travel to Venice, Cairo, Zurich, and more, unraveling the mysteries of space and time. Use your photographic memory and deductive powers to analyze locations and clues to fit historical patterns. Unlock hero Malachi Rector’s destiny, and uncover his mysterious connection to ex-Special Forces soldier David Walker. Moebius, a contemporary metaphysical adventure from the master storyteller Jane Jensen, the creator of Gabriel Knight and Grey Matter, is available 20% off for pre-order for Windows and Mac OS X on GOG.com. That's only $23.99 until April 15, when the game is expected to arrive. Pre-order now, and play the 2-chapter GOG.com exclusive demo while you wait for the release! When a secretive government agency enlists Malachi Rector to determine whether a murdered woman in Venice resembles any particular historical figure, he is left with nothing but questions. Why would the U.S. government hire him--a dealer of high-end antiques--to look into a foreign murder? Why does David Walker, a former Special Forces operative he meets in his travels, feel like someone Malachi’s known all his life? And how come everytime Malachi lets his guard down, someone tries to kill him? Moebius is a contemporary adventure that merges classic point-and-click puzzle solving with Jane Jensen’s sophisticated storytelling. Travel the world using Malachi’s unique deductive powers to analyze suspects, make historical connections, and uncover the truth behind a theory of space and time the government will defend at any cost. This thrilling new adventure game from master storyteller Jane Jensen (Gabriel Knight, Gray Matter) and Phoenix Online Studios (Cognition, The Silver Lining) introduces Malachi Rector, an expert in antiquities whose photographic memory and eye for detail transform people and clues into interactive puzzles. If you miss the times when adventure games were played mostly for the great and immersive storytelling, not just for the puzzles, humor, and views, be sure to pre-order Moebius for $23.99 on GOG.com. That's 20% off the full post-release price, and you'll get to set the mood for the game with the full soundtrack (MP3/FLAC), available instantly. You can also jump right in to action with the GOG.com-exclusive demo, covering the first two chapters of the game! The 20% off special pre-order discount offer lasts until April 15, when the game is set for launch. I got this from Phoenix Online -- Good info to have! Looks super interesting, and Jensen is an excellent storyteller! I don't have the income to spend that much on games anymore* (especially not when they go on sale for half price or less ) but I'll keep this on my radar. *Hell I'm still waiting for Broken Sword 5 to come down in price! RenaissanceMom wrote: *Hell I'm still waiting for Broken Sword 5 to come down in price! You are not going to believe this, but it's the Daily Deal at Steam TODAY! How's that for Providence? That is amazing and AFAIK the first time it's gone on sale...and at 50% off, wow!! Thanks Genki! I JUST am downloading Broken sword 5 right now....awesome that it is 50% off! 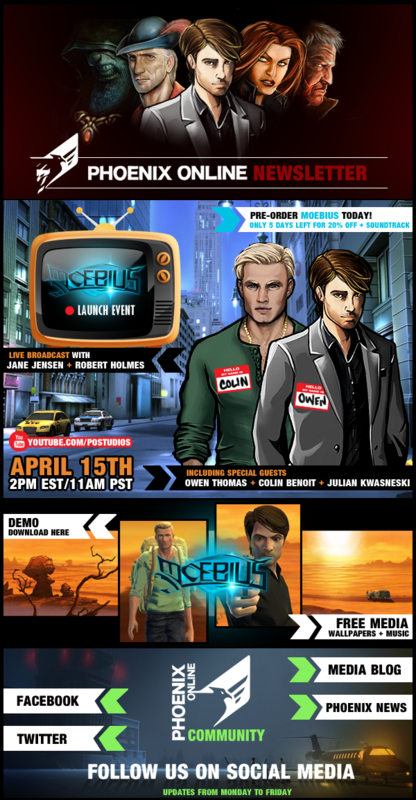 April 15th is only 5 days away now, big day in which we launch Moebius on Steam, GOG.com, Gamersgate, our own Phoenix Online Store, and many other distribution outlets. As it is now a Phoenix tradition, that date becomes a day to celebrate! We shall be hosting the launch event live on our Youtube channel. The date is April 15th, at 2pm Eastern time, 11 am Pacific. We will have the company of Jane Jensen along with Robert Holmes to talk about the game; also with us, special guests Owen Thomas who does the voice for Malachi Rector, Colin Benoit who gives life to David Walker, and the talent of Julian Kwasneski who coordinated the voice acting for the game. Of course, the usual suspects from Phoenix will be there, including Katie Hallahan and Cesar Bittar, with myself in the hosting and technical management of the live event. Once again it is an honor to be able to be part of yet another Phoenix launch, and this time around with so much talent coming online with us to celebrate all the hard work done so far. Looking forward to having you all there! Remember you can connect directly to Youtube and as you watch us you can interact live with any of us at any given time via Youtube comments. The date is April 15th on our youtube channel at 2pm Eastern time, 11 am Pacific. Be there!